Running with Rainey is simultaneously the best thing and the worst thing. As a joint new year's resolution to get in better shape, we've been trying to run together several times a week. Yesterday, as we started out in the warm afternoon sunshine, my iPod jamming away to White Panda's mashup of pop music from 5 years ago, she got so excited she jumped for joy. Let me repeat: my dog jumped for joy. The term "jumping for joy" is usually reserved for conversations about exuberant children on the playground or an overexcited adult who received a job promotion, not for animals. Yet, there is no other way to describe her behavior. I had put her special elastic leash on, the one we only use for running or hiking, hitched it around my waist and began jogging. Two steps down the trail, Rainey leapt straight up like Tigger, as if her legs had springs and propelled her into the air. Startled, I looked at her and she jumped for joy again, her paws coming even with my shoulders, and her little black tail wagging. Smiling, I thought back to a New York Times article I had read a year and a half ago about dogs and functional magnetic resonance imaging (fMRI) findings indicating emotion. What if running with me brought joy to Rainey too? What if she felt just as happy about a beautiful winter day and the trail beneath her paws as I did? Anyone who knows me will tell you I'm obsessed with my dog. I'm one of those annoying people with a "Bark Less, Wag More" bumper stickers on my car, a frequent snapchatter of my dog begging for belly rubs and have way too many jackets with the pockets chewed out because I left some treat unattended and zipped away. I'm also a ferocious believer in the power of animals to combat mental and physical illnesses. Research on human-animal interactions has repeatedly found petting a dog can buffer against physiological indicators of stress (Siegel, 1990; Allen, Blascovich, Tomaka & Kelsey, 1991; Allen, Shykoff & Izzo, 2001), increase cardiovascular health (Allen, Blascovich, & Mendes, 2002) and reduce symptoms of anxiety and depression (Barker & Dawson, 1998; Hoffman et al., 2009). Even among the elderly, interaction with dogs only once a week for six weeks has been shown to significantly reduce depression (Le Roux & Kemp, 2009). It is no wonder then that, in a relationship teetering on the edge of destruction and in a job I despised in the spring of 2011, I began looking for a dog. 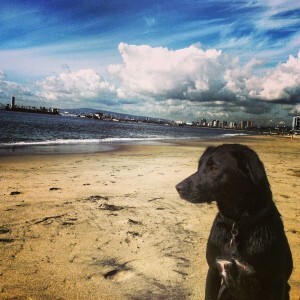 Rainey, a four year old black lab mix, entered my life at a time when I needed her the most. She made me get up every morning to walk her, ensuring I got fresh air and the occasional laugh before work. She was waiting for me when I came home, not caring whether my boss had made me feel small for wearing the only clothes I could afford. She licked away my tears when I had a particularly rough day. When I quit my job and took up a part-time gig at a rock gym, she came to work with me every day, eager to see the other dogs there and to greet the customers as they came in. She rode across the country with me and my partner as we drove to start our new lives and my graduate school program. Rainey loves California; most mornings you can find her lounging in the warm sun on our deck, occasionally lumbering over to the base of our guava or persimmon tree to munch on the fallen fruit. Needless to say, with lots more sugar and way more sunshine than she knew living in Boston, Rainey has put on a bit of weight, which brings us back to jogging as a joint New Year's resolution. Yesterday, as she and I went for a 4 mile run, I thought back to the New York Times article that came out a year ago about dogs and their emotions. Dr. Berns, the study's principal investigator and author of the New York Times article, began to ask himself the same questions I had: do dogs love being with us? Do they feel the same emotions towards us as we do towards them? Having been a neuroscientist for over 20 years, Dr. Berns was familiar enough with fMRI machines to adapt them to canine participants. Typically, fMRI machines are used to take pictures of human brains that show which areas are using more or less blood and oxygen, giving a relative approximation of where brain activity is occurring. Research using fMRI methodology is hard; participants have to lay absolutely still in a confined space while the machine noisily scans their heads. Dr. Berns did the unthinkable; he trained over a dozen dogs to remain absolutely motionless for 30 seconds. Suffice to say, Rainey would not be able to get her brain scanned, since she thinks every sound is the promise of food. After the dogs had become "M.R.I.-certified," Dr. Berns and his colleagues were able to lead them into a mini-fMRI lap machine, where they would place their heads and scan their brains. To examine what brain regions were active compared to similar structures in humans, the researchers paraded past each dog their favorite toys, familiar or unfamiliar humans and gave various hand signals associated with commands. Comparing the results in brain activity from their sample of dogs to that of humans, Dr. Berns and his team found striking similarities between activity in the caudate nucleus; in humans, this area shows increased activation when anticipating things that give us pleasure, like food, music and love. Results from initial dog fMRI studies suggest that the caudate nucleus responds to items that could bring pleasure to canines as well, with structurally similar areas lighting up when dogs were given the hand signal for food or when they smelled a familiar human. This same region, associated with positive emotion in humans, was activated in dogs when their owner returned after momentarily stepping out of the room. The functional homology, or similarity in select brain structures between dogs and humans, provides initial evidence that dogs may feel pleasure like we do. Although by no means proving that dogs have emotions, Dr. Berns' work suggests that puppies, just like children, may be capable of jumping for joy. Anticipating a great run (which it was! ), Rainey may very well have had increased blood flow and oxygen to her caudate nucleus as I hooked up her leash yesterday. While fiscally questionable to spend research grants on the self-serving question of do our dogs love us, I am all the more happy knowing that maybe I bring joy to my dog's life too. For individuals interested in reading Dr. Berns' original article in the New York Times, you can check it out here. Additionally, Dr. Berns has since published a book on his research called How Dogs Love Us, which you can find on Amazon or at other major book retailers.